This could be because the pre-login handshake failed or the server was unable to respond back in time. I have an ASP.Net website that connects to SQL server always-on failover cluster instance. When I configured the Connection String inside Web.Config as SQL Authentication, the connection has been connected successfully. But when I tried to configure the Connection String as Windows Authentication. I got the below error. Public server role and the user is mapping the correct database. But unfortunately, the issue still persists! In this section, I will explain the above causes one by one in more details. Make Sure that the SQL Server Services state is running. In case, it is not running try to start it. In case. it’s not started check SQL Server Service was unable to start. Again, Open SQL Server Configuration Manager. Make sure that The SQL Server Browser service is running. From right side, Navigate to SQL Server Configuration Network. The following Dialog should be shown > Click on Alias tab > Get the Server Alias. In the end, you should make sure that you have provided the correct SQL Server name to avoid this issue. At the Application server, try to open the CMD as Administrator. Run “Ping” command with the Database Server IP for each node and for load balancer IP to ensure that the application server can reach to the database server and vice versa. Try to repeat the same “Ping” command from the Database server to the application server IP. Try to login with The application pool account that runs the website on the IIS to the application server. 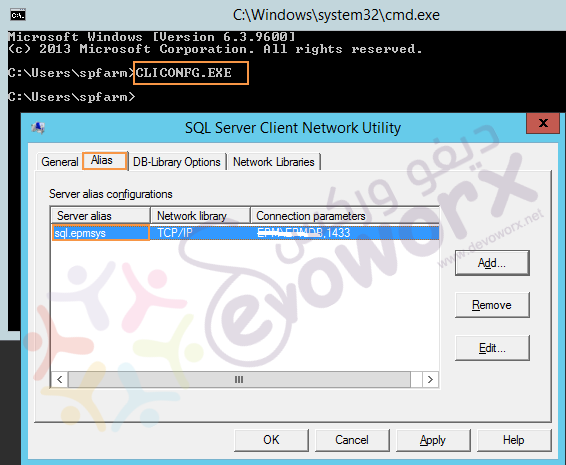 Then try to create a UDL file as mentioned at How to check SQL server instance connectivity from the application server to database server for a specific user without using SQL server management studio. To get the TCP port number via SQL Configuration Wizard. Open SQL Server Configuration Wizard. Navigate to SQL Server Network Configuration. Right click on TCP/IP > Properties > IP Address. Scroll down to IPALL > Check TCP Port. To get the TCP Port number via T-SQL. Use Master Database > Click on New Query. The output should be retrieved as shown below. Try to telnet the SQL Server IP to its TCP port. Note: if the telnet command is not recognized, you should install telnet feature as mentioned at ‘telnet’ is not recognized as an internal or external command, operable program or batch file. If the port is not blocked, you should get the following. Else that the port is blocked and you will need to open it. To open port on SQL Server. From SQL Server > Open Windows Firewall. From right side > Select Inbound Rules. Right click on Inbound Rules > Select New Inbound Rule. In Rule Type Step > Check Port. On Protocol and Port Step > Select TCP, Special Local Ports > Type the SQL Port. Open Network and sharing center on SQL Server. Right Click on Ethernet > Properties. If IPv6 has been checked, so It should be checked on the application server. If IPv6 has not been checked, so It should be unchecked on the application server. How to Check SQL Server Instance Connectivity without using SQL Server Management Studio. SQL Server Service was unable to start. Thank you.. in my case the port number was different in both the node. Asking questions are genuinely pleasant thing if you are not understanding anything completely, but this piece of writing offers nice understanding even. When I tried to connect the DB from SSMS from my application server I am getting the same error as mentioned in the post, but if I try it for the 2nd time I am able to login successfully without any problem. SQL is installed in different server and I am trying to connect it from different server using SSMS. Welcome 🙂 thanks for your feedback! Hi I am so glad I found your site, I really found you by error, while I was looking on Bing for something else, Regardless I am here now and would just like to say many thanks for a remarkable post and a all round interesting blog (I also love the theme/design), I don’t have time to browse it all at the minute but I have bookmarked it and also added your RSS feeds, so when I have time I will be back to read a great deal more, Please do keep up the excellent work.